What's new with Dave-- is the rumor about a new book true? Take advantage of the special deal Dave made with Lynda.com (he calls it the NetFlix of training) where you can find, in addition to Dave's 15 short but powerful videos, great training of all kinds-- 30 day free trial (normally 7 days!) go to www.davecrenshaw.com/free. 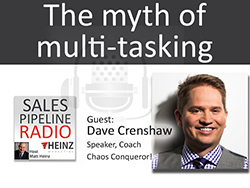 About our Guest: Dave Crenshaw is the master of helping business owners triumph over chaos. He has appeared in Time magazine, FastCompany, USA Today, and the BBC News. His first book,The Myth of Multitasking: How ‘Doing It All’ Gets Nothing Done, has been published in six languages and is a time management best seller. His latest book, The Focused Business: How Entrepreneurs Can Triumph Over Chaos, is also a small business best seller. As an author, speaker, and business coach, Dave has transformed thousands of businesses worldwide.